It’s only natural that Norwegian Air – UK should have chosen Sir Freddie Laker as one of the first “heroes” to adorn the tail of one of its 787-9 aircraft. Now his son, Freddie Laker, has launched a web site, sirfreddielaker.com, providing a retrospective of his father’s professional and personal life. Sir Freddie is best known as the founder of Laker Airways and Skytrain, which after years of battling regulatory authorities in the United Kingdom and established long-haul carriers in both the United Kingdom and the United States, took off in 1977 offering one-way fares from London to New York for £59 and from New York to London for $135, less than half his competitors’ fares. The flights were Spartan. Initially, passengers were expected to purchase their tickets on the day of departure, thereby eliminating the need for a reservation system. Although initially successful financially, Skytrain came to an end on Feb. 5, 1982, when the company went bankrupt. “I was trying to share him with the world, hoping that people will take an interest given all the new things coming out this year,” he said. 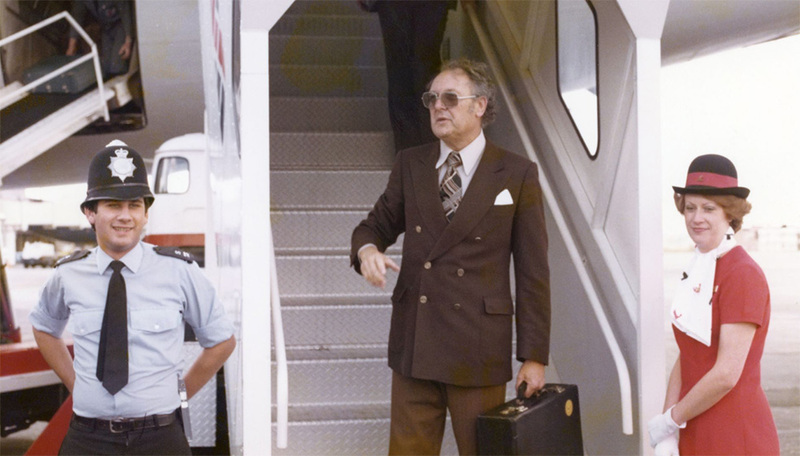 The site is divided into four sections: a biography of Sir Freddie; a gallery of Laker Airways and Skytrain, featuring scores of photos and press clippings; a gallery of Sir Freddie in the Bahamas, where he briefly operated an airline after the collapse of Skytrain; and a gallery of his personal life, with numerous personal photos. Laker said he also learned that a major biography and documentary film about the rise and fall of Skytrain were in the works. 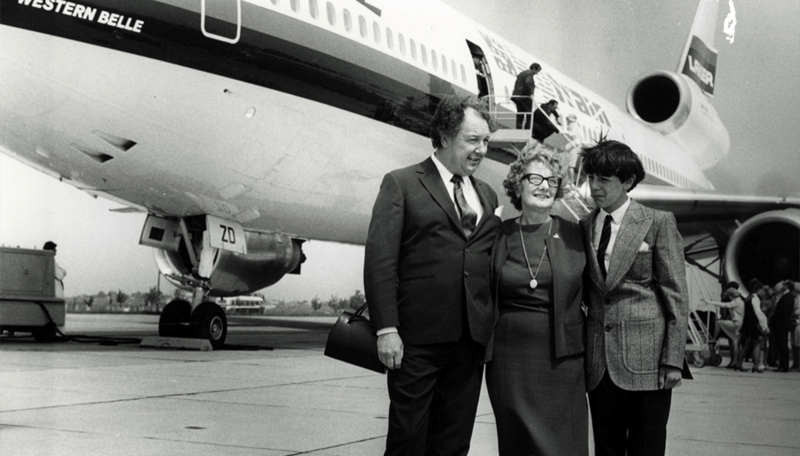 The sudden resurgence of low-fare, no-frills air travel, with the emergence of carriers like Norwegian Air and Air Asia, also made it the perfect time for a retrospective on the man who started it all. Laker hopes visitors to the site will come away with an appreciation of the duality of Sir Freddie’s personality. While an astute businessman, “he was also really funny, with the bigger-than-life smile and sense of humor,” Laker says. The day after his father died in 2006 at the age of 84, Laker said, he had the image of an Oozlum bird, the symbol of Laker Airlines that was displayed on the tail of its aircraft, tattooed on his right shoulder. Laker said his father’s choice of the mythical creature, which The Oxford English Dictionary describes as “[a] bird displaying ridiculous behavior” was an example of Sir Freddie never taking himself too seriously. 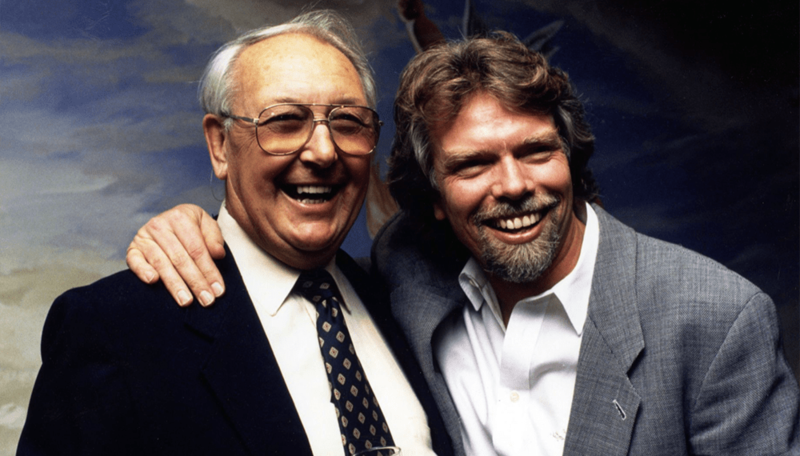 Sir Richard Branson, the founder of Virgin Atlantic Airlines, was an early recipient of Laker’s attention and advice. Although he didn’t go on to create a low-cost carrier like his mentor, he made full use of Sir Freddie’s advice that he use the press to call attention to himself and his enterprises. Laker said he’s an admirer of Branson, along with Tony Fernandes of Air Asia and Bjørn Kjos, the founder and CEO of Norwegian Air Shuttle. He credits all three with carrying on elements of his father’s vision. He cited Fernandes as coming to closest to embodying his father’s energy and personality. “He’s running one of the best low-cost operations in the world,” he said. 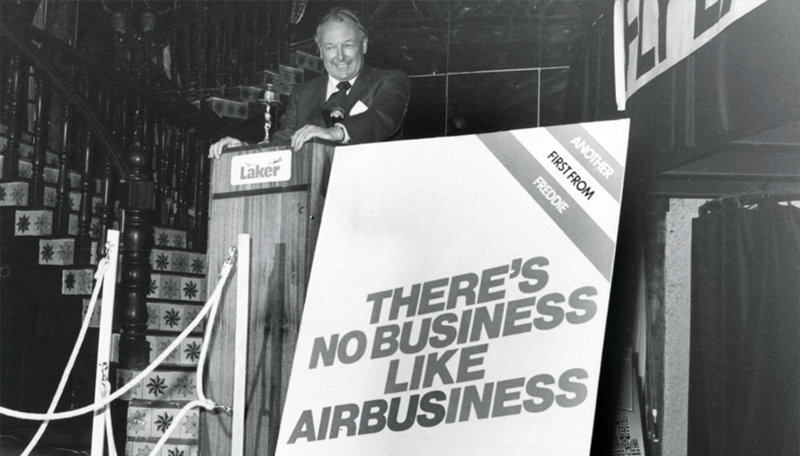 Laker sees his father’s greatest achievement as “fighting against the status quo” to make air travel available to everyone without special gimmicks or tricks. Laker is convinced that Skytrain could have succeeded had it not been for the opposition of both the British and American governments, interested in protecting established transatlantic carriers. It was only when newly released documents detailed how both governments and legacy carriers sought to undermine Sir Freddie that Laker became truly angry about how his father had been treated, he said. One advantage low-fare carriers have today, Laker said, is the vast improvement in aircraft efficiency, with planes like the Boeing 787 and the Airbus 321 flying further and using much less fuel than their predecessors, dramatically lowering the cost of operating an aircraft. “The introduction of these super-efficient planes allows the number crunchers to say ‘Maybe we can make this work,’” he said. Laker said that he wouldn’t call today’s low-cost airlines “no-frills,” since they are constantly trying to induce passengers to purchase amenities, such as meals and drinks, extra legroom and, of course, checked baggage. This “up-selling” strategy is also being used by legacy carriers to boost their revenue. While he closely follows the commercial aviation industry, Laker himself chose to follow a different career path. “I felt like I spent my entire childhood being groomed to be an airline CEO,” Laker said. “By the time I was 15, my dad could point to a plane in the sky and I could identify it as a Boeing 727-200 series or whatever – things that I think no one at my age should probably know. “At the same time, I was just oversaturated with it. Even 25 years ago, my dad was still a pretty well-known guy, and it was just a big shadow I didn’t want to live in,” he said. He’s started several Internet-related businesses and confesses to “spectacularly” crashing one of them. Most of his ventures have been successful, and, as he notes, “two out of three [businesses] isn’t bad.” Today, he’s a principal in a consultancy firm that helps transform companies around the world. « Zimbabwe Airways sold its first and only B777-200ER for dismantling, as it had no money for its heavy maintenance, the dream of having 4 is gone, one sold in the US and status of the $70 million for 4 is also gone, now what happens with 2 State owned airlines? Air Zimbabwe is the national carrier and Zimbabwe Airways is the ZANU-PF airline that was suppose to replace Air Zimbabwe with 4 x B777-200Er and 4-6 ERJ-145’s, another dream gone, now just the nightmare left for struggling, cash starved Air Zimbabwe, just so much BS and what has been achieved? nothing, other than the usual missing millions of $US in another shameful scam in Zimbabwe.